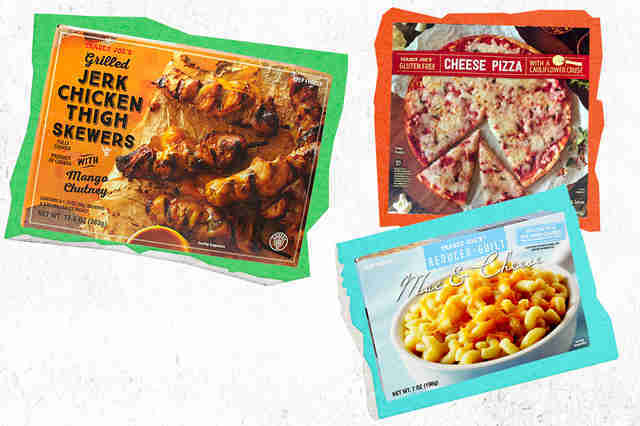 Trader Joe's freezer section is an oasis for folks who want a little variety with their lazy food prep, an arctic sea full of pizzas, Greek cheese spirals, mac & cheese, pot pies, and other artery-hugging fare. But it's also stocked with healthier meals, with a selection of entrees that would give even the most avid home chef a workout to prepare otherwise. You’re probably thinking “who are you to tell us what’s healthy?” You’re absolutely right to question me: I just ate deep-fried double bubble gum at the county fair, so I officially have zero credibility. But you know who does? Registered dietician Sheila Flavin, M.S., R.D.N. So we asked her to weigh in on the best healthy options at TJ's. Keep an eye out for these frozen gems at TJ's. Having them around might just justify your county fair binges. Through some modern miracle of food science, people have turned veggies into a pasta that still tastes a lot like the real, delicious deal. You can kind of taste the cauliflower flavor here, but the consistency tastes like real, creamy potato gnocchi. Just throw together a cup of the cauliflower gnocchi with some red sauce and a sprinkle of parm on top. Pro tip: Pan fry them first… boiling them turns them into little balls of mush. How they make this healthy dish taste so rich and creamy is nothing short of a miracle, but let’s just roll with this sorcery. You can cook this dish in the microwave, the oven, or the stovetop and pour the saucy scallops over some zucchini noodles or rice. The scallops are tiny but tender, and the cheese sauce is super thick, creamy, and somehow healthy. A lot of Chinese takeout is extremely salty, but these are low in sodium, fat, and calories. You can pan fry them, put them in the microwave, or heat them on the stovetop with some greens and low-sodium chicken broth to make wonton soup. 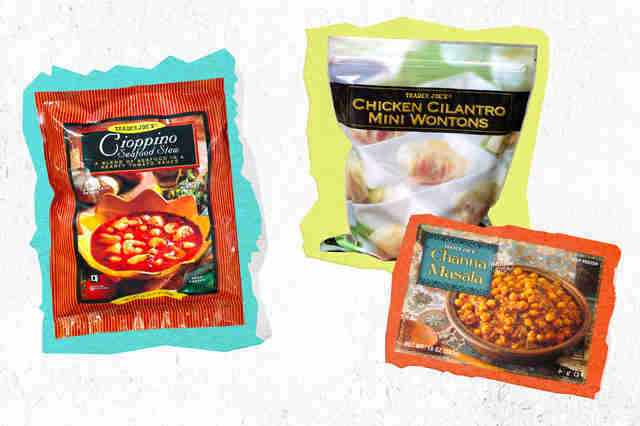 Amid Trader Joe's -- sorry, Trader Ming's -- huge collection of east Asian fare, they're a rare bite that manages to be delicious without overloading you with calories, sauces, or carbs. This is an intensely flavored dish, so you really don’t need to do much else besides cook it while you queue up Cool Runnings. The savory, charred grilled chicken meshes well with the sweet, fruit-based sauce. “No one eats a whole pizza,” explains Flavin. (Editor's Note: Strongly disagree.) “Honestly though, even if you did, it’s a reasonable meal packed full of veggies.” The creamy mozzarella, fresh sauce, seasoning, garlic, and a little olive oil gives this veggie-loaded meal great flavor. Once in awhile you just have to splurge for the real thing, but this is a much healthier alternative if you crave it regularly. Perfect for dinner or to split as a side dish, this low-fat, protein-packed macaroni & cheese gives you the same taste of the popular smooth and creamy comfort food without destroying your hard work at the gym. Yeah, that’s right. Healthy (ish) mac & cheese. Let that soak in for a minute. Throw in some grilled, shredded chicken breast or chicken sausage (also available at Trader Joe’s) to add even more protein. 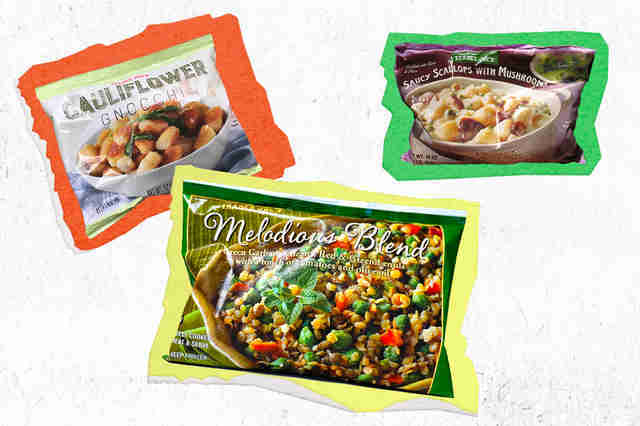 Trader Joe’s version of the traditional casserole goes heavy on the peas, carrots, and tender shredded meat. The dish is traditionally made with a very thick layer of potato, but this version has a ton of filling with just a thin layer of mashed potatoes that get really crispy and brown in the oven. The beef broth keeps the meat really juicy and makes it easy to pull apart. “This dinner is an excellent source of protein and great source of fiber,” said Flavin. Mexican cuisine can become unhealthy pretty quickly if you load on the sour cream, queso, guacamole, and fatty beef, but this dish offers a healthier alternative that’s equally delicious. 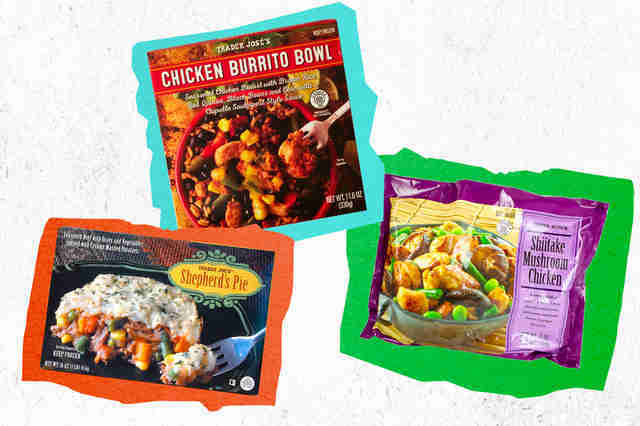 The bowl combines seasoned chicken breast with filling red quinoa, mild cheddar, hearty black beans, brown rice, sweet corn, and a chipotle style sauce to tie it all together. “This dish is super high in protein with a reasonable amount of sodium and a good source of iron and vitamin C,” explained Flavin. The dark meat chicken is combined with flavors of tangy ginger, green onions, garlic, and white pepper to give the stir fry a punch without a General Tso-level of fat. The shiitake mushrooms have a naturally earthy flavor and soak up a ton of tasty sauce, and you can serve this over browned up cauliflower rice for a nutritious, filling dinner. 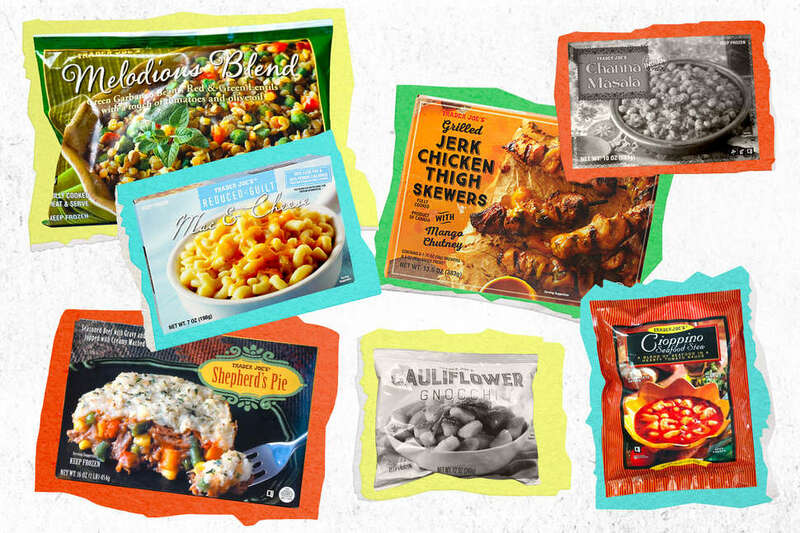 Jessica Kelly is a freelance food and travel writer that would probably spend all of her money on sushi if Trader Joe’s didn’t make her life easy AF with these cheap, frozen meals. Watch her share countless pics and videos of her Trader Joe’s hauls on Instagram @Adventures.Are.Waiting!